« Excel and Astrology – Who Knew? Have you ever looked at your astrology chart and wondered, what does this mean? Even if you’ve been to a professional astrologer, there is still a lot of knowledge to be gained by developing your own understanding of your birthchart. Astrology can be complex, but it is built piece by piece. We have the signs, indicating certain phases of development; the planets, the basic energies of life; the houses, the various areas of life; and the aspects, which link the pieces together. I’ve always maintained that we don’t really have to learn astrology. We already know it in our bones. We’ve been through these cycles so many times; we deeply understand astrology even if we don’t often articulate our knowledge. Who couldn’t feel the difference between the Sun being in the top half of the chart, which means it was daytime when the person was born, as opposed being in the bottom half of the chart, a person born during the nighttime hours? Who hasn’t felt the sliver of potential of the New Moon or the fulfillment of the Full Moon? Who can’t visualize the morning star just rising before the sun or the evening star, beautiful and still before slipping below the horizon? Let’s just look at the overall pattern of your birthchart. For fun, you could gather a few other charts, too, or look at Astrodatabank and get a few charts of celebrities or historical figures you particularly relate to. Take a look at what you have in front of you. Most western charts are constructed on a circle with 12 demarcations for each of the 12 houses. At the beginning point of each house is a symbol representing a sign of the zodiac. This is the actual degree of each sign of the zodiac at a particular point in the arc of the ecliptic. Each house is influenced by the sign of the zodiac found at the beginning of the house, the cusp. Now look into the interior of the circle to find the symbols for each planet. Depending on the type of chart in front of you, you may also find lines connecting certain planets to certain others indicating the aspect relationships between the planets. These are the key factors in chart interpretation: the houses, the signs on the cusp of the houses, the planets in each house, and the aspects between the planets. Find the beginning point of the first house and moving counterclockwise, follow the circle around glancing at each of the 12 houses. What is the overall pattern of the distribution of the planets in the houses? Are most of the planets in the bottom or top of the chart, or to the right or left of the midline? Are there many houses with no planets at all, and a few that hold all of the planets? Are the planets distributed across most of the houses? Nothing at the top. A nightime chart. The first sense you get of a chart comes from this first glance. What could you intuit about a chart with five or six planets in one house? What if someone had all of their planets in the nighttime part of the chart? What if someone had most or all of the planets in the top half of the chart? For a fun and more visceral feel for a chart, try this. 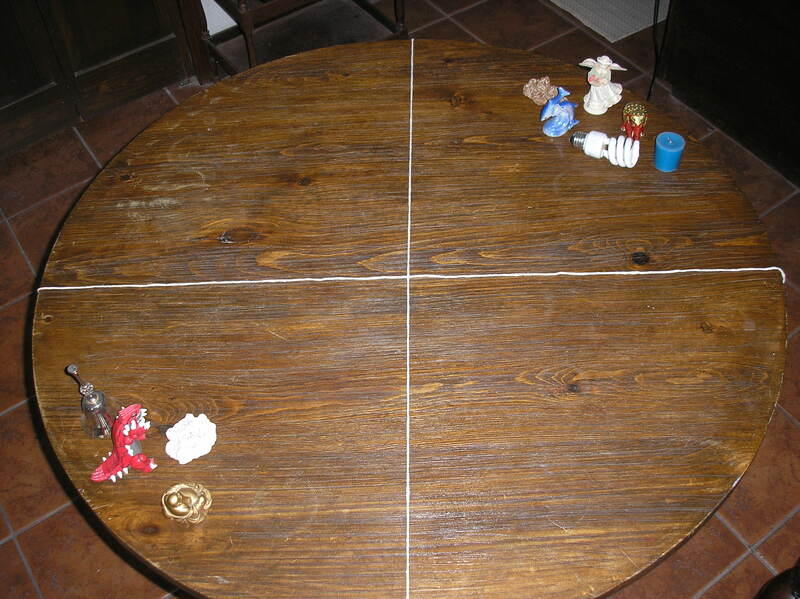 Working with a round table and gaffer’s tape or ribbon, construct a line from the top to the bottom of the table surface, representing the midheaven and fourth house cusp, and a perpendicular line across the table from the ascendant to the descendant. You can also use a large circular piece of paper, at least three feet in diameter, drawn into four quarters. 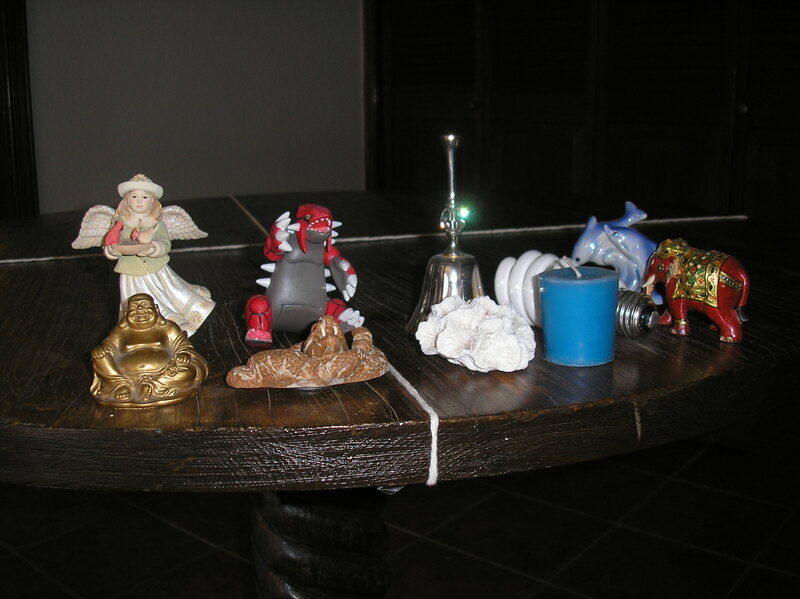 Now collect nine objects from around your house and yard, objects about the same size. Perhaps a pine cone, a bell, a small figurine, a small stuffy, a candle, a ball of twine…whatever you have around. At this point you just want different objects, not ones with any particular meaning. Stand at the bottom point of the table, and without reference to any chart, arrange your objects in different ways within the circle. Put all of the objects in the bottom half of the chart, and let the arrangement tell you something about a person with this arrangement of planets. 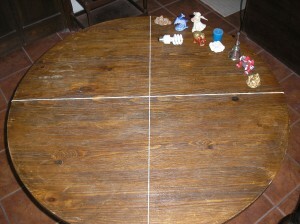 Move the objects to the top of the chart, or scatter them evenly around the circle. At each design, stop and look at your tabletop – what does that arrangement say to you? I have several clients with this pattern. Focused? Narrow, perhaps? Now take your own chart and arrange the objects on the table as they are in your chart. Don’t worry about placing them exactly, just make sure you get the correct number of objects into the correct quadrants, or quarters, of the chart. Now step back and take a look at the whole. 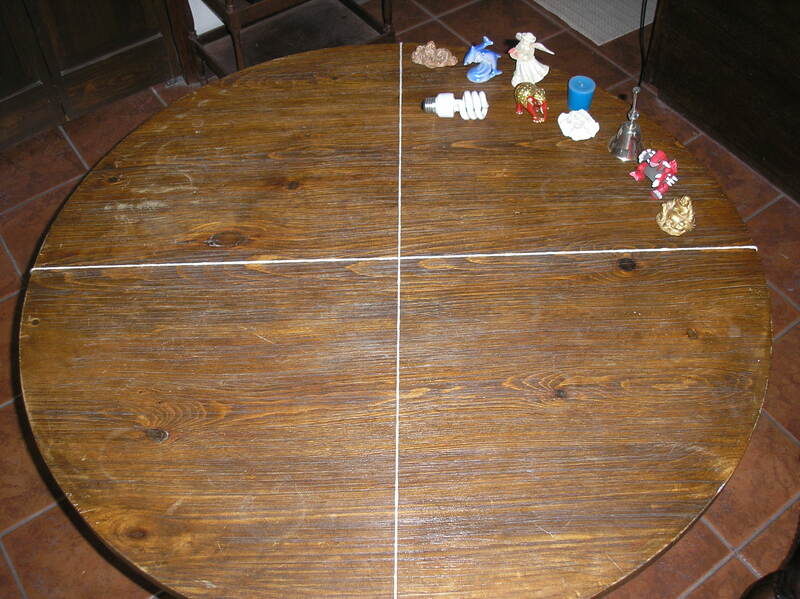 What immediately becomes apparent by seeing the objects displayed in the circle this way? Are there one or two areas that really command your attention? Why? Are there areas full of planets or is there a whole area that is devoid of planets completely? If you have other charts to work with, rearrange your objects according to the patterns in the other charts. What is immediately apparent in the other charts? Technical name for this is Seesaw. Issues of balance, maybe? Don’t dismiss your hunches because you haven’t heard or read a “professional” explain them in that way. Keeping it simple, what do the arrangements tell you? You don’t need to be a musician to be moved by music. Let the symbolic language of astrology speak to you. I looked at my pattern with an intuitive “eye” instead of a critical assessment. I finally now have a word for the two signs that contain almost all of my planets. 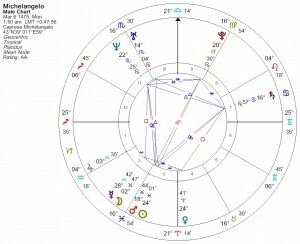 (All the professional astrologers I’ve seen just exclaim they’ve “never seen a chart like that”). 2 Bundles above with an escapee opposing the biggest stellium below.. Always worried me … but you know what it looks like? A peace sign! Thanks for the different perspective! I had fun with this excercise today. 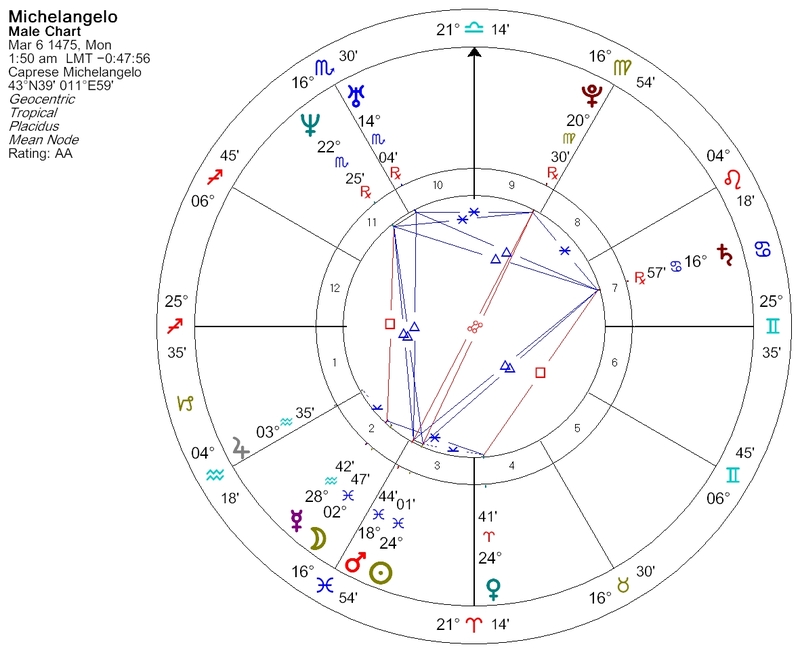 With only three planets below the surface so to speak, my chart looks like an umbrella, or perhaps like those antennaes they try to contact aliens with. And for the first time I realised that those three (I included Chiron), are all retrograde. I wish I had seen that before the Erin Sullivan Q & A at Skywriter. She told me a bit about the Saturn in my chart, and I’ve ordered her book to see what other interesting stuff might be there. But yes, a bit top-heavy. Very focused, yes, but also always insecure and more than a bit introvert. Good fun! Oh, and you can call me Nat all you want! Thanks, Nat, for your comment. I like that umbrella image, like the planets on top are protecting the ones underneath. Erin Sullivan’s retrograde planets book is my current favorite astrology book. I have learned so much from that book and she is an excellent, interesting writer too. Have fun with it. Thank you. I did this yesterday and have been carrying the image in my mind since. I’m not sure what it means yet, but it feels like I’m seeing my own birthchart patterns in nature and views out my window. 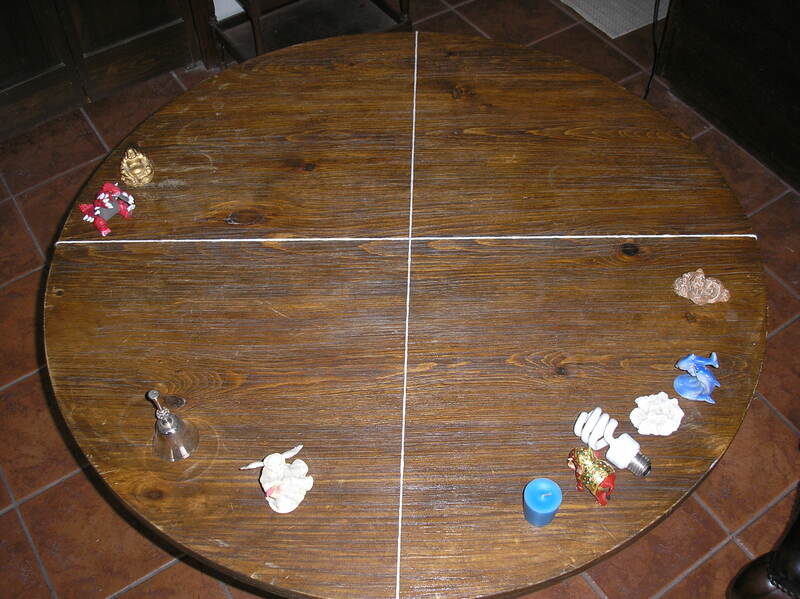 Or maybe I just like that idea better because I see the teeter-totter in my chart with fragments. I keep picturing something “hit” the big cluster and tiny bits flew into another house: shrapnel. I know that feels like a violent image and it confuses me because I don’t consciously feel any harshness or angst, but it is the image I keep seeing, so I guess I can trust that. Ultimately though…I am learning a lot from this blog–and it helps me put your business one in more perspective too. Thanks for leveling for the beginner in me. Nicole, I’m so glad you tried it. I love the image, by the way. I’ll write more when I get back from Panchakarma. Almost all (8) of my planets are all clumped into two adjacent houses. Just looking at that alone, I would think either “she’s very focused; maybe obsessed” or else “she’s screwed – totally unbalanced!” At any rate, it warrants a “wow!” and makes me a little uneasy. Yes, Annie, that’s a lot of planets in two houses. It’s called a Bundle, although strictly speaking all of the planets would be within two houses. You’ve got a couple of outliers, some escape! Don’t be uneasy. You’ve been living with it all this time; just knowing about it isn’t going to make it more difficult. Actually, I know several spiritual seekers who have this kind of tight configuration. Maybe there’s only a couple of areas left to get right, and then you’re finished!